I am a full blown germaphobe. I don’t mind dirt at all, but the idea of germs and things that can make me sick makes me bug out (get it, “bug” out). I wasn’t always this way. It was probably becoming a mother in the height of the swine flu epidemic (I don’t know if it was an official epidemic, but it sure felt that way). This unleashed the crazy in me. Like, double wash, triple hand sanitizer then anti-germ hand lotion crazy. Before that I would grab an apple right out of the pile in the grocery store and take a bite. The idea of that now makes my stomach turn. It’s really important to clean your fruits and vegetables before you eat them. Even the organic ones. Unless you grow it yourself, your food is exposed to all kinds of things along the way before it gets to the grocery store. And truth be told, the thing that creeps me out the most is produce in stores that other people had their grubby little hands on. I’ve seen way too many people not wash their hands after using the public bathroom to just nosh on an apple right from the shelf anymore. Ugh, I can’t even think about it. So, now you want to wash your produce since I just reminded you that people are gross and don’t wash their hands. They sell bottles of fruit and veggie wash in most stores. I dig that. It’s easy to just grab a bottle of it. The problem is I go through a 22oz bottle in a little over a week and the stuff costs anywhere from $3 to $6 dollars in the store. That adds up when you’re a greensypants! Pour vinegar into a large mixing bowl then add the baking soda. Remember that volcano you made in 5th grade? Fizzy, fizzy. (Kids love this part so get them involved and excited to wash some veggies. YEAH!) Make sure you have enough room in the bowl for the reaction. Stir mixture until all the fizzing stops, add water then stir. I like to put the juice of a whole lemon into it for fragrance. You can also use store bought lemon juice. This step isn’t necessary but the vinegar has a pretty dominating smell. The lemon is much more pleasant. Pour the mixture into your empty spray bottle, (a funnel is useful here), and there you go. The bottle pictured here had some sort of cleaner in it that I dumped out. It came in a gift basket someone gave to me (sorry to whoever that was). It’s fine to use a bottle that has had a cleaning product in it if you thoroughly clean it. You will have to fill it with mild soap and water and just keep pulling the spray trigger to get all the yuckies out of there. It takes some time but just chill and watch a show or something (kids come in handy here, too). You just saved like five bucks, people! 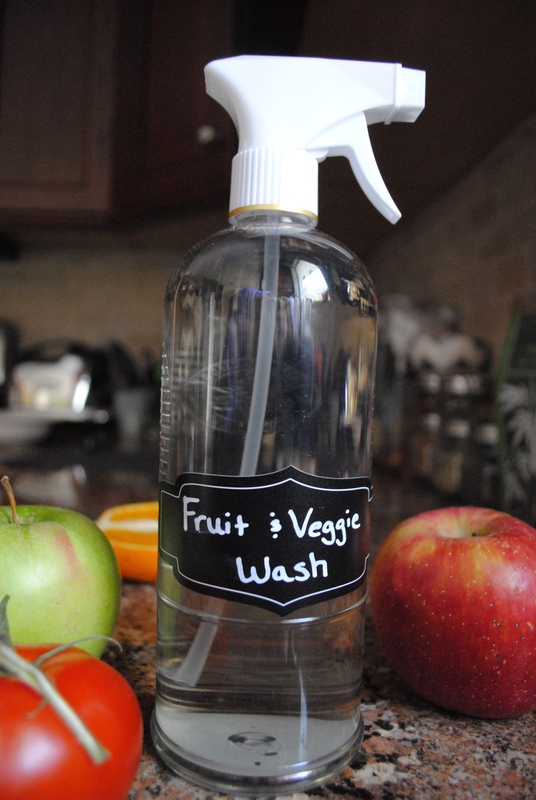 You want to spray all of your non peeling produce with this and let it sit for a few minutes before washing off. With berries and grape tomatoes and such, just put them in a bowl and spray as you move the fruit around making sure you cover all surfaces. Fill the bowl with water then toss in a strainer. Avoid using on cut fruits and vegetables like squash or zucchini since it will absorb the mixture. It’s not harmful in the least but it will alter the flavor. Wash before you cut! Now go wash some whole, real food and get chomping!